Monarimo is the PUP that uses misleading techniques to prevent removal. Use Reimage to locate malicious components and get rid of them faster than with uninstall instructions. A full system scan blocks virus reappearance and prevents traffic to malicious domains. How did Monarimo hijack your computer? How to remove Monarimo adware? Although the developers of Monarimo virus claim that they’re passionate about improving user’s web browsing experience, it seems that they’re more passionate about making user’s browsing experience unbearable. Monarimo is an ad-supported program, which computer security experts classify as adware and a potentially unwanted program (PUP). This program is meant to deliver uncountable amount of intrusive ads whenever the user browses the Internet. It is compatible with Windows XP, Vista, Windows 7, and Windows 8 OS. 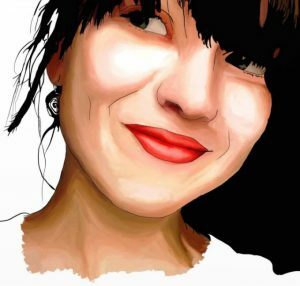 Unfortunately, the developers are working on a version for Mac users, too. If you do not want to share such information with the developers of this suspicious software and allow them to manipulate it however they want, you should remove Monarimo from your computer. For that, you can use Reimage anti-spyware software. However, data collection is not the only suspicious activity Monarimo adware carries out. It uses the data it gathers to create targeted advertisements. Ads by Monarimo are extremely annoying and they can make your computer run slow. This annoying adware program delivers pop-up ads, banners, and also injects hyperlinks into random text lines on the websites the victim visits. You should be aware of the fact that Monarimo PUP does not seek to deliver you useful ads – it only seeks to catch your eye and tempt you to click on Monarimo ads. You should not do that, because these ads are meant to trigger web rerouting to predetermined web sources, which can be hazardous. We strongly recommend you to stay away from these ads. Monarimo adware has an official website, but it looks suspicious, and it hardly provides any information on how the program functions or what is it meant for. You can download Monarimo from that website, however, the majority of PC users who have discovered this software on their computers claim that they did not download the program from that website or any other download site. Therefore, it is obvious that this software spreads using another method. It spreads via software bundles, and it is one of the most effective software distribution techniques. That means you can receive an offer to download Monarimo while installing another free program. However, this offer is not going to be revealed in a direct way. To avoid installing Monarimo or another PUP you have to set Advanced or Custom mode while installing any software to your computer. Then, you will be provided with a list of “recommended downloads.” We strongly recommend you to opt out all of them, because such hidden additional downloads almost always appear to be PUPs. IMPORTANT. Please take note that by choosing Default/Standard installation settings you automatically agree to install additional downloads. Please be aware of that! If you have accidentally installed this adware program alongside other software, navigate to page 2 to see Monarimo removal instructions. Monarimo virus is hardly useful software, and it is not recommended to keep it on the computer system since it collects a lot of information about your browsing activities and worsens computer’s performance. Plus, Monarimo ads hardly provide real promotions or any useful content at all, so there are no reasons to keep this adware on your PC. If you want to stop these ads and prevent this software from collecting information about you, delete it from your machine. 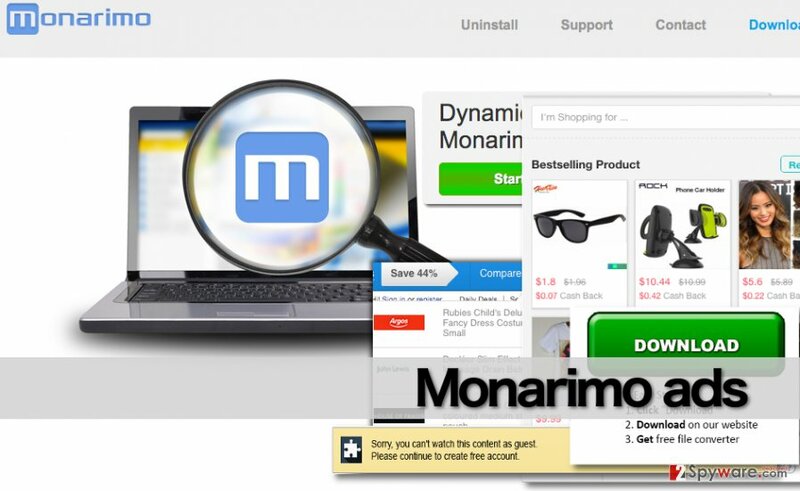 To uninstall Monarimo PUP, you can use one of the anti-spyware software we recommend. Alternatively, you can uninstall it manually; for that purpose, follow Monarimo removal instructions that are given below. Here, look for Monarimo or any other recently installed suspicious programs. Wait until you see Applications folder and look for Monarimo or any other suspicious programs on it. Now right click on every of such entries and select Move to Trash. When in the new window, check Delete personal settings and select Reset again to complete Monarimo removal. Once these steps are finished, Monarimo should be removed from your Microsoft Edge browser. Here, select Monarimo and other questionable plugins. Click Remove to delete these entries. Now you will see Reset Firefox to its default state message with Reset Firefox button. Click this button for several times and complete Monarimo removal. Here, select Monarimo and other malicious plugins and select trash icon to delete these entries. Click Reset to confirm this action and complete Monarimo removal. Here, select Extensions and look for Monarimo or other suspicious entries. Click on the Uninstall button to get rid each of them. Now you will see a detailed dialog window filled with reset options. All of those options are usually checked, but you can specify which of them you want to reset. Click the Reset button to complete Monarimo removal process. This entry was posted on 2016-04-14 at 05:28 and is filed under Adware, Viruses. You can quickly scan the QR code with your mobile device and have Monarimo manual removal instructions right in your pocket. How did you remove Monarimo?